This is one of those Easter hymns that beautifully tells the stories of the men and women who encountered the risen Christ. Verse 8 is especially poignant as it draws all of us--even those who were not present to witness the resurrection--into the story. While it may not seem like much, it's striking that all of us are a part of this cloud of witnesses and that our story, too, is blessed--because our lives, too, can bear witness to Christ's resurrection each day. Like Jesus, we are inheritors of eternal life--with the whole host of saints who have gone before us. While it's not Easter yet, or even close, it's helpful to remember that the daily act of "catching people" connects us to the past and the future, and that all of us together proclaim God's message of resurrection and new life. Eternal God, we give you thanks for the gift of faith and for the saints who have gone before us. Lead us into your truth so that we might proclaim your resurrection to all. Amen. Associate Pastor, Mount Olivet Lutheran Church, Minneapolis/Victoria, Minn. This God Pause daily devotion is brought to you by the alumni of Luther Seminary. Looking for spiritual refreshment? 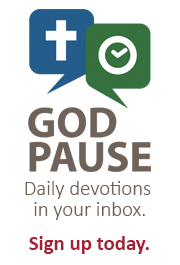 God Pause devotions are reflections sent daily via email.